After the success of our most recent event at London's favourite secret 'The Lion & Lamb' we are back at our beloved home, once again with Newcastles best loved soiree and imprint, Jaunt. Having attended many events here over the year it is an honour to be asked to take the stage in this most intimate of venues that has showcased only the best in electronic music. The music throughout the night will be a blend of Ambient, Jazz, Trip-Hop, Electro, Techno and House. Doors open at 5pm - Close. Legendary Newcastle born club night and most recently, record label 'JAUNT' launch their new event and sub-label < Journey Never Stops > next week and we've been invited along for the ride. Back in our home town on the 10th February. Expect a night of eclectic music of the higest order down at everybody's favourite basement bar in Leeds.. It's easy to accept that Leeds' Ste Roberts, as one of the trio behind the Hypercolour and Glass Table imprints, has quite an ear for music. Alongside Alex Jones and Jamie Russell he's been responsible for curating the label's broad and revered output over the past few years while quietly developing his own music with extreme care and patience. Having started out, as most good DJ/Producers should, as a record store 'guy' at Leeds' Tribe Records, Roberts has an uncanny ability to zero in on records that matter and it's that that perhaps marks him out as a DJ's DJ (just ask any of his colleagues and this tag becomes repetitive). Understated in his delivery, allowing records to breathe, the Yorkshireman graces the turntables at global clubbing institutions in an enviable gig-diary without unnecessary fuss or fanfare, instead relying on quality selections put together properly. The words 'quality' and 'properly' crop up a lot in conversation with Roberts and it's easy to see why – the fact he's insistent on taking his time with his own productions until they're ready to be released speaks volumes. Even when material is ready, he declares that he's not the sort of label owner to ram his work down peoples throats which probably explains why his debut release emerged on the not-to-be-sniffed at Fear Of Flying imprint rather than his own (although there'll undoubtedly be Hypercolour output 'at some point' according to the man himself). Following on the stream of our ever emerging European tour dates we are happy to bring you are first Berlin date at one of Berlin's most underground venues 'Anita Berber'. Debuting on the Baud label in 2010 with some understated dub techno in the Material Things EP, featuring a remix of the title-track by one Patrick Gräser, aka Answer Code Request, Dicicco’s music over the years has made its way to compilations and various artist EPs put out by labels like Stockholm LTD, Other Heights and Jonas Kopp’s Traut Muzik, to Semantica via the talent pool that is Svreca’s Nonnative Series. Dicicco’s own production palate ranges from the booming dub techno of earlier tracks like “Night Erosion” to the dirty sewer sounds of “16 Reels”, and most recently the spooky, tunnelling techno of “We let Go” freshly released by Jordan Czamanski’s Off Minor Recordings. Dicicco’s ties also stretch across the pond to New York after hooking up a 12” with Anthony Parasole’s The Corner in 2014 following the launch of his own independent platform Run Out Run. To date Run Out Run has released three of Dicicco’s own records, plus others by D'Marc Cantu, Killawatt, and a collaboration between John Osborn and Tallmen785, while more recently, Run Out Run’s second record for 2015 was a various artist EP headlined by October and L.I.E.S affiliate TX Connect. With some inspiration from David Attenborough’s Frozen Planet documentary, Dicicco established the Wood Bison-referencing Inner Surface Music label with AnD in 2011, and his own, fittingly cold and dusted-up Exit 12” sketched out his first release on the label the following year. It was around this time that Dicicco hooked up with Andrew Bowen of AnD for a track on Brothers, but it’s the Untitled split EP with Kowton on Paul Cooper’s sorely missed Project Squared which stands out as some of his best work. A resident of Northampton in the UK, Tom Dicicco – whose surname is pronounced Dee-chee-co - should be something of an inspiration to budding producers out there in proving that hard work, perseverance and a cordial attitude will eventually get you somewhere near to where you want to be. And he's a devil of a DJ. Blacpoint is an integral part of the Catch family, a musician first and foremost executing a range of diverse sounds through his performances and productions. Expect somber tones alongside industrial field recordings and night filled with music of the forward thinking mind. Throughout this year we will be providng intimite showcases across Europe with freinds/family and the artists of Catch. 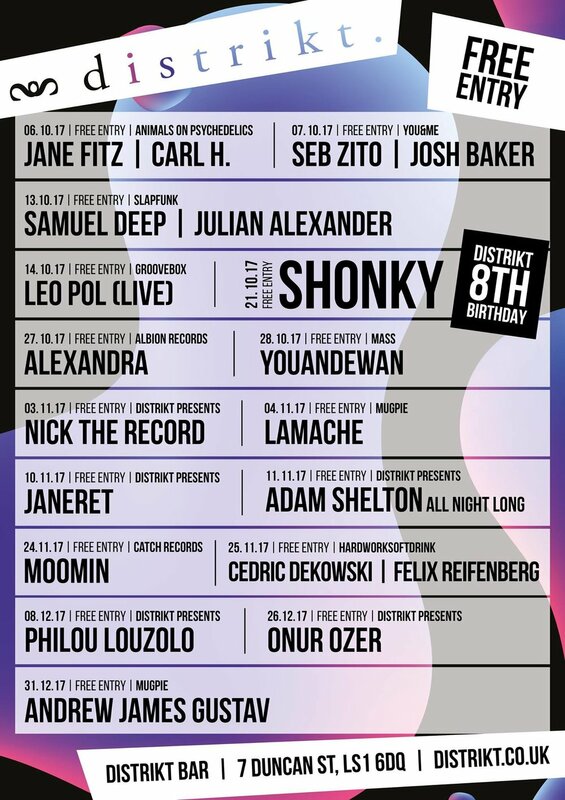 After hosting a nothing short of epic party at Shelter last time, Tough Luck have been invited back to do it all again. This time joined by a special line-up of Jaunt Records mainstays 'Blackhall & Bookless' Tough Luck owners and residesnt 'Adam Todd & Jonny Lawrence' Catch Recordings family 'Nadsat & Blacpoint' & 20/20 Visions 'Bobby Pleasure', along with Mixmags 'Funster'. Expect a night of electric atmosphere and diverse music...See you there.. Some clubs have iconic status and are on every DJ's wish list to play and sub club in Glasgow is one of them. These two have the honour of been residents for just shy of 20 years there. They have asked to play an extended set too and how can we decline such an offer. This one is set to be a real stand out event no doubt about it. Just shy of 20 years on, Subculture, with Harri and Domenic still at the helm, is the longest running weekly House night in the U.K. and very possibly worldwide. Subculture has hosted the cream of international House DJs and has a reputation as one of the best and most credible House nights in the world. Subculture has thrived where so many house clubs have flagged because the night has always embraced and sought out the most innovative and culturally relevant electronic music - regardless of fickle fashions or commercial pressures. Together and independently Harri & Domenic have headlined slots at the UK’s most important underground clubs such as Back2Basics (Leeds), Chibuku (Liverpool), Plastic People, The End and Fabric (London), and at clued-up, taste-defining international dance floors such as Panorama Bar (Berlin), The Rex (Paris), Moog (Barcelona), Deep (Madrid), Food Club (Brussels) and Propaganda (Moscow). Harri and Dom have also recorded 2 Subculture mix CDs on Arista (“Subculture”) and Loaded (“Subversion”) and one on Soma (“20 Years Underground”). Their Resident Advisor podcast in August 2010 was widely acclaimed as was their Pete Tong Essential Mix for Radio 1. In the first of our Summer showcases Catch Recordings are back at their home away from home, the intimate surrounds of Distrikt. After the success of our past 2 parties with Berghains 'Cosmin TRG' and Clones 'Literon', we thought to make it a bit more local this time with sheffeilds techno selector, Lo Shea. Lo Shea began his musical life as a guitarist and progressed from bands to the world of electronic music in the 90's.Starting out as a Drum n Bass artist signed to Formation records ( under a different name at this time )Lo Shea has experimented with many forms of music. A body music fanatic.He also has a deep love of jazz and blues as well as the often abstract world of electronic music. Falling in love with technology, and the uses of it in the hands of a musician. A Dj.Producer , writer, and guitarist as well as club owner and promoter.Lo Shea encompasses many things.He has produced multidisciplinary art projects as well as dance floor house and techno. He is also the curator and founder of Hope Works Sheffield and the associated Hope Works, WORKS and HOPE labels. Owner of Seaghdha - a vinyl only label for his own productions.LTD and owner of the Techno label 100 years. Were back at the Mons Calpe Suite, one of the few places in the wolrd were you can party over looking 3 countries and 2 continents. For our second installment at the Top of the Rock, we are teaming up with our good friends from Catch Recordings. Due to nature of the venue there is only a capacity of 200 people, so this event will be first come first serve. Entrance is £25, this includes the day party at the Mons Calpe Suite, and free entry to the after party in Eclipse Lounge. As a young twenty-something in Essen, Germany, Manuel Tur bucked the trend of hanging out behind the fahrradhalle, smoking Camels and drinking weiss beer, choosing instead to spend time honing his craft by immersing himself in the sounds of Ian Pooley, Masters At Work and Pépé Bradock. It wasn't long before his music started being released – Manuel's debut EP on London's Mada Music saw the day of light in 2002 when the young German had just turned 16, and more material was released soon through labels such as US imprints Agave and SoSound, as well as Sébastien Léger's own Bits Music. But that wasn't enough for Manuel so he hooked up with seminal UK house label Freerange Records. His track 'Acorado' became a staple in Jimpster's DJ sets so he set about getting the young producer to record an EP for Freerange. This deep bomb and others like 'Portamento' and 'Deviate’ have made him hot property in the world of house music. With further big tracks for Drumpoet with Dplay, Josh Wink's Ovum label with Langenberg, it's fair to say Manuel now is on top of his game. He was nominated for ‘Best Deep House Artist’ and ‘Best Deep House Track’ at the 2009 Beatport Annual Awards. His remixes for Phonique, Nick Holder, Jazzanova and D’julz have been cropping up all over the sets of those favoring the deeper, underground house sound that Manuel & co. are excelling in. 2009 also saw Freerange release the Manuel Tur debut LP entitled '0201', to widespread critical aclaim - DJ Mag crowned it Album of the Month, IDJ called it a 'majestic debut' and gave it 10/10, Germany's De:Bug magazine named it contender for album of the year and the world's DJ elite themselves voted '0201' second in GROOVE magazine's album chart! The album may come as surprise to those more accustomed to his wobbly dancefloor beats, but it’s a very nice surprise indeed. Broken beats cosy up to filtered French disco, lush deep house flirts with soulful US sounds – put it altogether and you have a beautifully constructed work of deeply atmospheric delights. It was about the same time, when Manuel set up his own label Mild Pitch, alongside fellow Essen-based producers Dplay and Langenberg, the latter who Manuel engaged with in the project 'Ribn', delivering striking remixes for world-renowned labels Poker Flat and Marc Romboy's Systematic imprint. Mild PItch quickly turned into one of the hottest new labels in house music around, with the label owners releasing some of their best original material and featuring stellar remixes by the likes of Steve Bug and Innervisions' Marcus Worgull. Fast forward 2012 and Manuel is set to release his second artist album for Freerange, “Swans Reflecting Elephants”. The advance single 'Most Of This Moment' is still causing a stir on dancefloors worldwide and sees the talented young German straying way out of his comfort zone to deliver a perfectly executed vocal track with confidence and total abandon. The track comes with a pair of remixes by legendary Hamburd-based producer Isolée (classic hit 'Beau Mot Plage') that was already released as anonymous limited white label vinyl in December 2010 and instantly made it into Phonica' Top 100 Singles of the year. New album release are in preparation right now, so expect more great things to come from this bright young producer. Blacpoint is a London based artist and Catch recordings resident, delivering forward thinking techno and electronic music.